More capers from the animated group. Earlier this week, Gorillaz shared The Book of Noodle, a multimedia story starring the animated band's guitarist. Today, the group have shared The Book of Russel, starring the band's drummer. Check the entire series of tweets below. 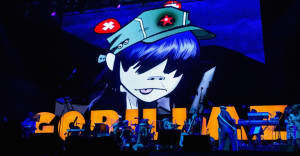 In this story, Russel multiplies in size by sixty times from swimming to Plastic Beach, the setting of the band's third album. He escapes pirates, Japanese whalers, and imprisonment as a sideshow in North Korea before returning to London and reuniting with his bandmates. The Book of Russel concludes with the sentence "The band was getting back together." In July, Gorillaz co-creator Damon Albarn said their new album would be ready "fairly soon." This morning, Noodle was announced as Jaguar Racing's new Global Ambassador.